and it was performing object tracking through background differencing. 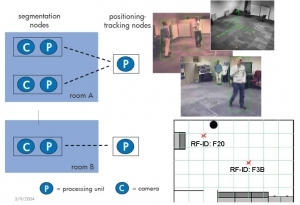 A higher-level node was putting together the data coming from single camera object tracking and was performing object positioning on the 2D map of the monitored environment. 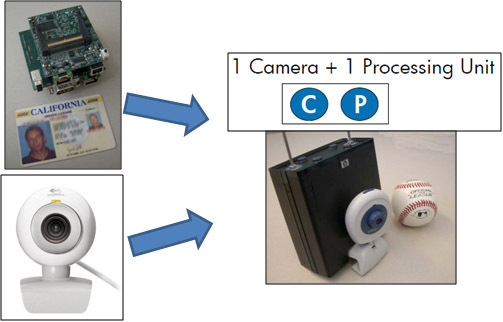 This system was connected to an access control system based on RFID (HF/UHF), and then I have personally added the biometric identification through fingerprinting: the fingerprint was read and a template was matched real-time with a fingerprint template stored in the RD/WR memory of the RFID. For further details please go to the slides presented at Bay Area Vision Meeting 2004 , Palo Alto o to the U.S. Patent 7,057,509.